The Philippine Heritage Law encourages the preservation, enrichment, and dynamic evolution of a Filipino culture as well as conserve, develop, promote and popularize the nation’s historical and cultural heritage and artistic creations. 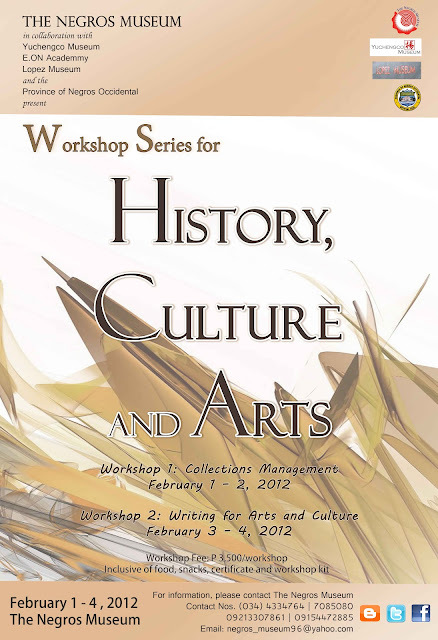 The Negros Museum, in cooperation with the Yuchengco Museum, Lopez Memorial Museum and Library, and EON Inc., will be hosting two seminar workshops on February 1 – 4, 2012 in line with the thrust of the Negros Museum to promote appreciation and awareness of Philippine and Negrense art, history, and culture. The Resource Persons are: Jeannie Javelosa (Curator – Yuchengco Museum), Dannie Alvarez (Museum Administrator – Yuchengco Museum), Niko Reyes (Business Development and Marketing Manager – EON Inc.), Mary Ann Pernia (Education Program Consultant), Ricky Francisco (Collections Management Consultant – Lopez Memorial Museum) and Peter Natividad (Collections Consultant – Lopez Memorial Museum). Open to all Museum Workers, Tourism Officers, Cultural Workers, Library Managers, Workers and Members of Arts, Cultural and Heritage Councils, Teachers of Humanities. Learn how to share and write about these topics to a wider audience. Get an overview of the different fields and opportunities in writing about arts and culture--be it visual arts, architecture, theater, music, or design. Topics include: Communicating Culture, Overview of communications as a practice in museums/cultural institutions; Preparing a Press Kit; Communicating via digital technology; Interfacing; Technicalities in Communications Marketing. We sure hope that you would consider this important project for the 1st Quarter of the Year 2012.